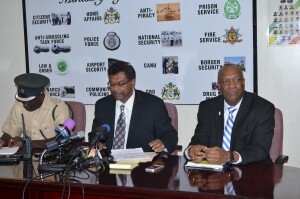 Vice President and Public Security Minister Khemraj Ramjattan says that he will not resign from his Ministerial portfolio. This is after People’s Progressive Party (PPP) General Secretary Clement Rohee called for President David Granger to dismiss Ramjattan. “I have the confidence of the President and I have the confidence of the National Assembly and I think I have the confidence of the country as a whole and I will not resign at the behest of Rohee,” said the Minister. Ramjattan however stated that should the President ask him to step down from his portfolio, he would be willing to do so. “If the President asks for my resignation I will give him. If the National Assembly passes a motion asking for my resignation I will give the national assembly,” the Vice President stated. The Minister has already convened a Commission of Inquiry into the riots at the Camp Street prison which left 17 prisoners dead.